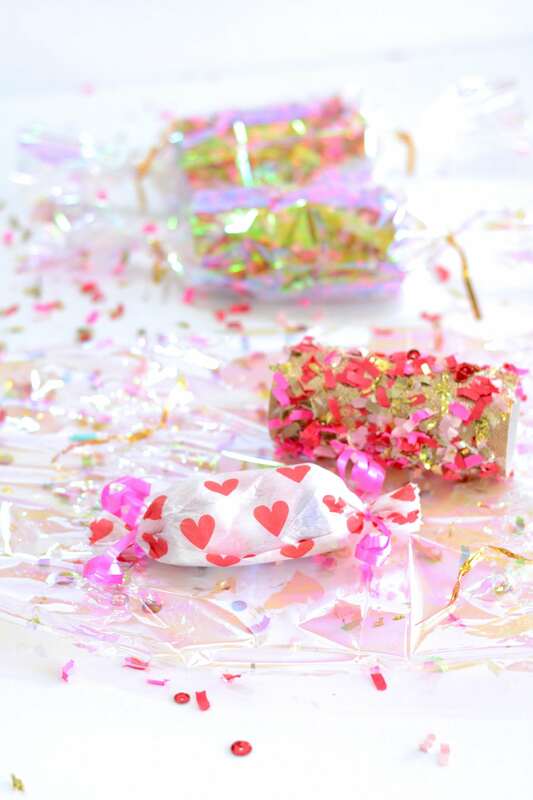 If these iridescent confetti party favors aren’t the most magical thing in all the land, I don’t know what is. 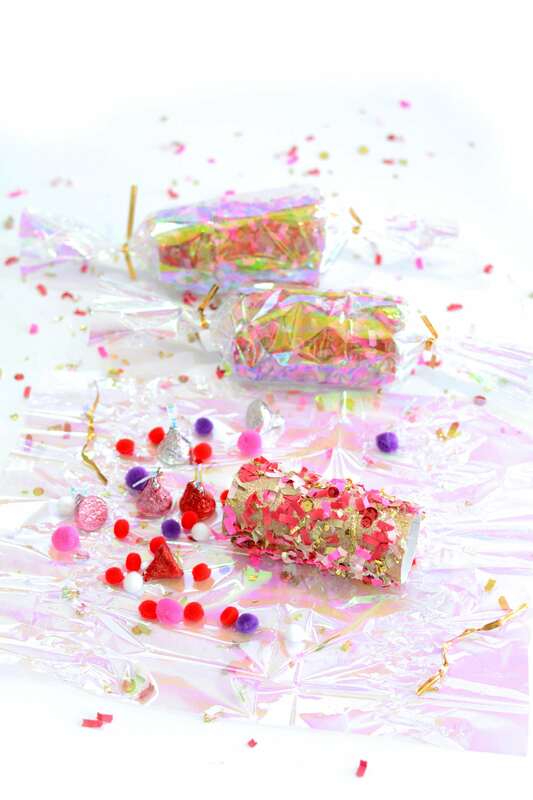 A different spin on my recycled paper tube Confetti Poppers, these beauties are a great alternative if A.) 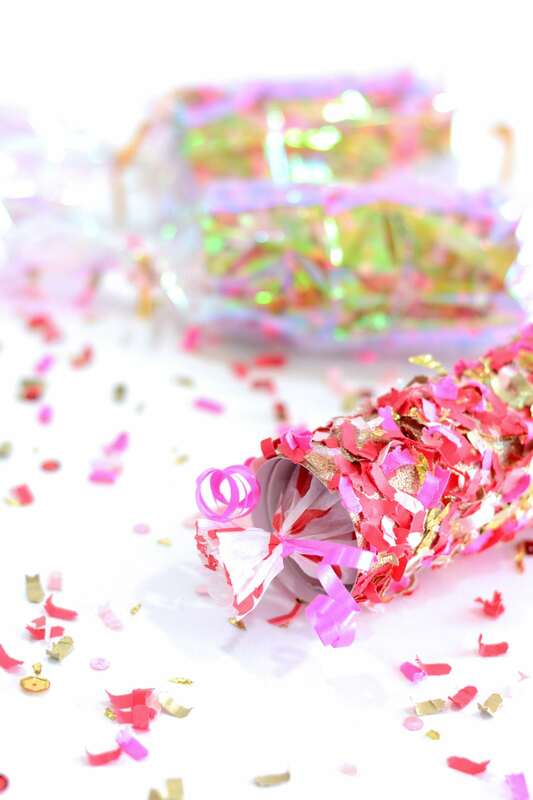 you prefer the confetti to be secured to the tube (vs. falling out like in the traditional poppers) or B.) 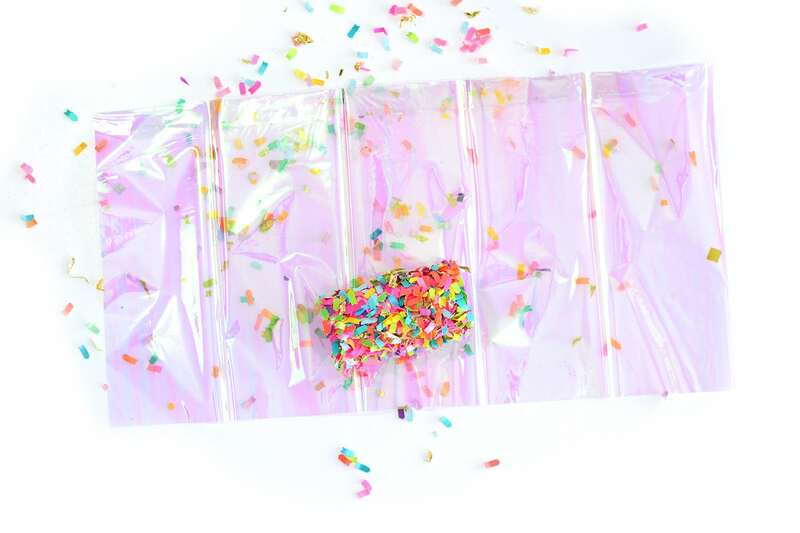 You’d like your poppers to be more colorful and magical from the outside to make an impression right off the bat. And if you combined this technique with the confetti on the outside AND filled them with confetti?! 😱 Best. Ever. First you’re going to want to cover your paper tube with a piece of coordinating (or contrasting!) colored card stock, just so we have a pretty base. (Most of it will be covered with the confetti, but we’ll still see some of the background peek through!) To do this, just use a bit of hot glue and wrap the card stock around the tube, trimming excess once it’s secure (if you need to). Next you’re going to want to fill a small paper plate with some Mod Podge and roll your paper tube in it to fully coat with a generous layer. You can lightly tap off any major excess to prevent huge drips. 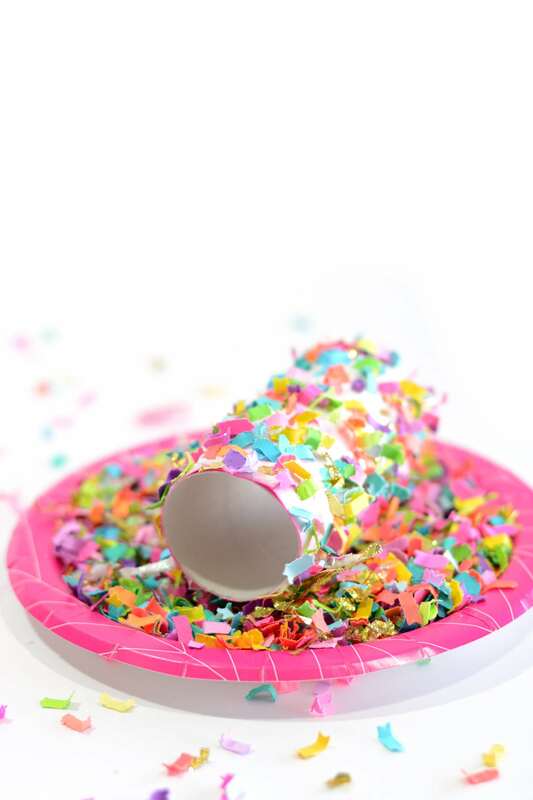 Repeat the same thing, but this time rolling the coated tube in confetti! Repeat with as many tubes/confetti colors as you’d like. When your tube(s) are completely dry, wrap up in a piece of clear or iridescent cellophane. (For a standard toilet paper tube size, I like to start with a piece of cello that is about 16″x9″ and then trim the ends after I tie it closed — this just helps evening out each side a little easier.) Twist the cello at one end of the tube and secure with a piece of ribbon or twist tie. Through the other un-tied end, fill your popper with small trinkets and/or treats, then tie up that side as well. Trim the cello at either end to your desired length. BONUS: If you want to take things a step further, you can even choose to make tissue paper rolls to put into your tube before wrapping in the cellophane. Simply add your treats/trinkets to the tissue paper, roll up, and insert into the tube. While this adds an extra step, it can be fun to use coordinating tissue for a little extra pizazz. You could also choose to just use the tissue rolls and not wrap the tube in cello, if you wanted the confetti to really stand out. So many options! Either way you choose to make these for your next party or special event, one thing is for sure: you’ll have the most magical of magical favors evah!